Furthermore, we used an analog modeled filter that was approximated using real circuit designs. The complete topology was modeled with all of the aspects of the electronic components involved, and then converted over to source code. The result is a very organic sounding synth bass plugin, which has no hint of that cold digital wavetable sound. This is what we mean when we say it has an “organic sound.” This is what you hear in urban music. Each key piece has it’s own sound, color, and character to it. It’s not trying to be something else. It’s it’s own individual and we achieved this with BASSalicious. Remember the first time you heard Neo-Soul Keys® and your ears were suddenly opened to the sound you always wished you had, but could never achieve. The first oscillator is free. You will have access to all of the synth functions. After you purchase, you will get access to the other 3 oscillators as well as the 63 high quality custom synth bass presets. 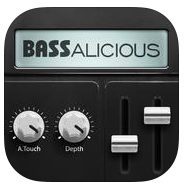 As an added bonus, we have adopted the new AudioUnit standard, so now you can seamlessly use BASSalicious inside of your favorite iOS DAW as if it was apart of the sequencer. Presets that you make in the app and/or the plugin will be shared automatically. The recommended iPad devices are the iPad 4th generation and higher, with the exception of the iPad 3.